The olympic bobsled track at Riessersee has long been awakened from their slumber. Not kissed by a young prince, but three sprightly, dedicated pensioners have helped it to its late honor. Konrad Spies and his colleagues stayed stubbornly, when they headed out 10 years ago, equipped only with folding saws and shovels to bring the bobsled track back to life again. What was initially dismissed as idiocy is now a protected monument. Suddenly people remember back to the glory days, as from 1910-1966 spectacular races took place on this route. In 1936, she also was the olympic course.To live up to the old glory, historic races are held. As then engage volunteers with shovels and other equipment to work in many volunteer hours back to build a natural bobsled track. Despite setbacks, such as thaw, the dedicated organizers keep up and give their last to hear the sound of the skids in the snow again. At that time, up to 15,000 ice blocks were picked from the Riessersee and built by the curve masons in a month construction period. In dangerous curve sections you can still see iron pipes, which served as security structures. Despite all efforts, deaths were to mourn in the rapid race back in the days. The most spectacular curve at that time was the Bayernkurve that one still can imagine today. Modern protective clothing was still unknown. Knitted sweaters and jelly bag caps were all the rage, at best a kind of leather helmet and goggles were worn.Big names came here from Werdenfels: Anderl Ostler, Hanns Kilian and Wolfgang Zimmerer just to name a few.At the olympic games in 1952 Oslo, the german team could retract gold. At that time the total weight of the bobsled team played a crucial role. This brilliant victory was also recorded in the movie „Die schweren Jungs“. Parts of this film were i. a. filmed in the „Fischer-Nazi–house“ in the Spring Street in Garmisch. In February 2014, here in Garmisch-Partenkirchen, the Red Bull Heroes are at the start. Excitement and fun are guaranteed. 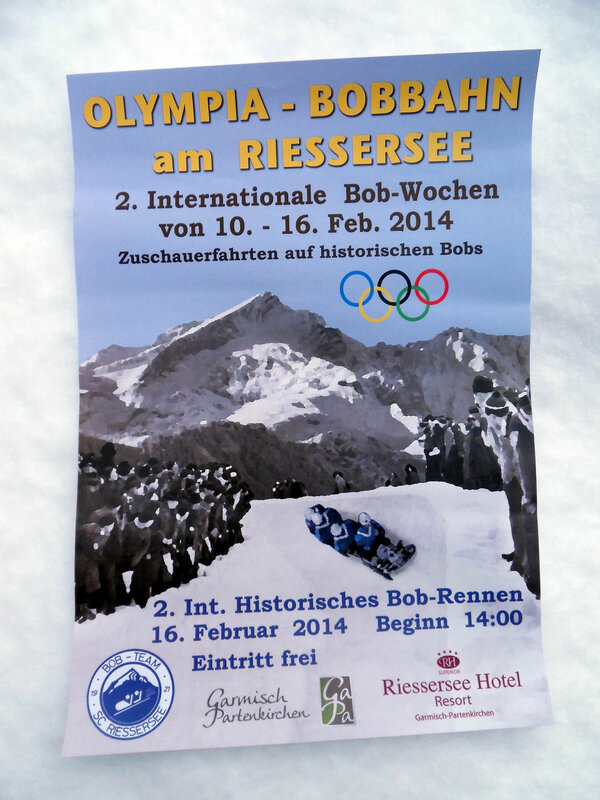 And the glory of the old time returns to the Riessersee, where once also the sports club Riessersee was founded.